You’ll lose excess weight: Cut out the biscuits, takeaways and snacks, and eat instead plenty of whole-grains , fruit, vegetables, beans, lentils and nuts, and you will probably save a lot of unwanted calories. According to the world’s largest study on successful weight loss, eating a diet high in fruit and vegetables is a vital part of losing weight and keeping it off. Fruit and vegetables are low in calories, virtually fat-free and filling. If you satisfy your appetite with fruit, vegetables, pulses and whole grains, you’ll be less likely to turn to high-calorie snacks. But on detox we don’t want you to count calories and the chances are, Once you’ve finished the eating plan, you’ll need to count calories again. Cellulite will diminish: Lose fat and you lose cellulite – and that’s great news for 85% of us women who are plagued by it. In fact, it affects 95% of women over 30! A healthy way of eating combined with exercise and skincare are the only proven ways to beat cellulite. So, follow the detox and you’ll be well on the way to losing that unsightly cellulite. You’ll have more energy: Vitality and health are the ultimate aims of the detox. By focusing on fruit, vegetables, salads, whole grains and pulses – food that are fresh, have not been processed or overcooked and have not been adulterated with artificial additives – you’ll be providing your body with all the nutrients it needs to work efficiently. You’ll also be reducing the ‘toxin’ load on your system so you’ll quickly begin to feel healthier and more energetic. You’ll get fewer colds: On the detox, minor infections such as colds, sore throat and flu are less likely. Fruits and vegetables are the best ways to get high levels of vitamin C, betacarotene and other antioxidants in your diet, and research shows that people with high intakes of these nutrients have fewer sick days than others. You’ll get rid of bloating: Swallowing too much air and eating in a rush are the most common causes of bloating. 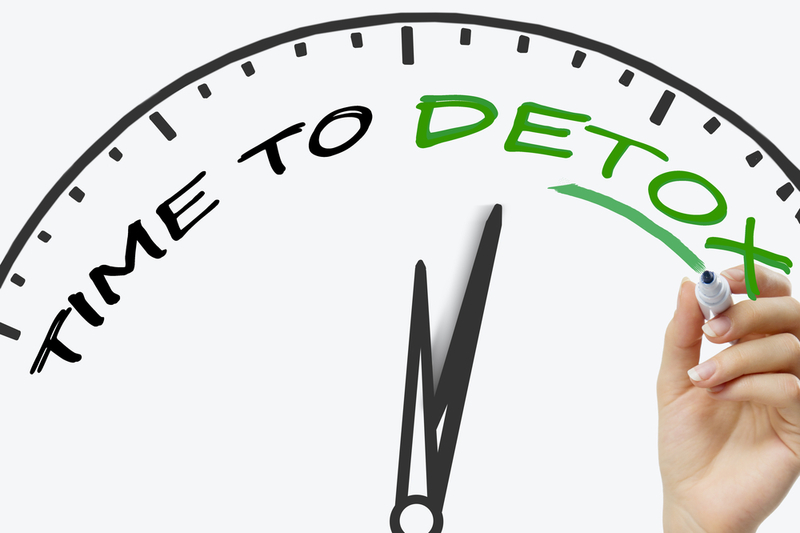 During the detox it is essential that you learn to take your time and sit down to eat. Chewing thoroughly and eating slowly will help reduce the amount of air swallowed with food. You should also avoid fizzy drinks as they introduce more unwanted air. Try plain water and still juices instead. Bloating is sometime a reaction to certain foods. Cutting out or reducing common culprits such as Yeast, wheat products, bran cereals or vegetables from the brassica family (such as cabbage, Brussels,sprouts, broccoli or cauliflower) may help. You’ll enjoy better health: Numerous studies have linked a diet rich in fruit and vegetables with a lower risk of illness and diseases. According to the American Institute for cancer research, eating at least five servings of fruit and vegetables each day could prevent at least 20% of cancer cases. Researchers found that people who eat at least two apples a week are up to 32% less likely to develop asthma than people who eat fewer apples. And a study found that people who eat the most fruit and vegetables have stronger bones. You can lower your blood pressure: Eating more fruit and vegetables can lower blood pressure. This is due to the high content of potassium, which helps regulate the body’s fluid balance. An Italian study found that 81% of people with high blood pressure who started eating three to six servings of fruit and vegetables a day reduced their medication by half. Your skin will look smoother: Eating more fruit and vegetables – reducing the toxin load on your body – improves the clarity and texture of your skin. Your skin plays a vital role in ridding your body of unwanted substances and waste products (via sweating, skin oils and dead skin cells). According to an Australian study, people with diets high in fresh produce had smoother and less lined skin than those eating diets high in red meat and sugar. Your hair will shine: The vitamins, minerals and phytonutrients in fruit and vegetables do wonders for your skin, hair and nails. A healthy diet tackles beauty problems from the inside; improving the rate of hair growth, Cell renewal and collagen formation. You’ll feel calmer: Studies show that people whose diets are higher in fruits and vegetables find it easier to handle stress.